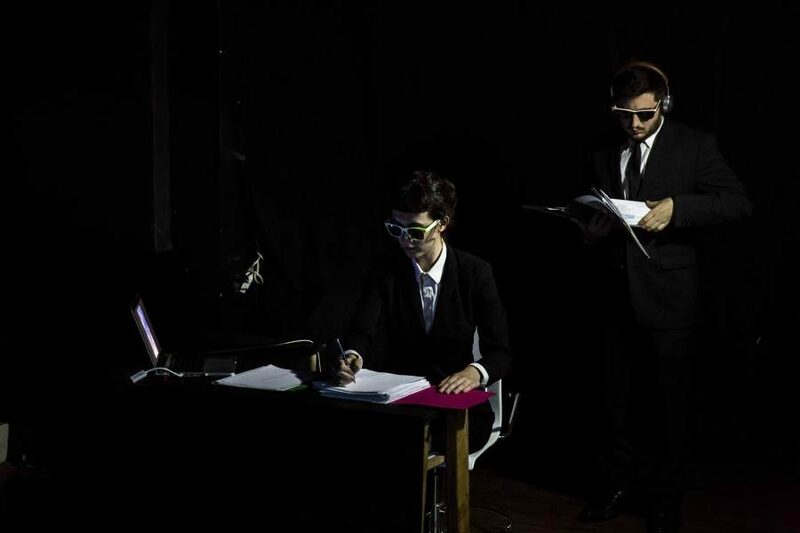 In SOMEONEPLEASELISTENANDUNDERSTAND (they’re wiretapping our brains), written by Brett Evan Solomon, directed by Kelsey Lurie, and performed at The Brick Theater as part of this year’s Exponential Festival, the complexity of communication gets a singular and creative theatrical treatment. Told in seven audio sections, the work examines communication from three vantage points. The first vantage point is of the outsider looking in. The work personified this inscrutable and mysterious perspective by dressing Solomon, Lurie, and their collaborator Gabriel Vasquez as quasi-NSA agents. The three are onstage for the entirety of the work but never say a word. At times they embodied the audio text performed alongside them, at others they commented on the text through gesture and ensemble work. Lurie’s direction deserves great accommodation: her sense of rhythm and stage pictures, her ability to make silent performers speak clearly, elevated what would otherwise be a challenging and opaque scene. The three agents, enacting the wiretapping the title refers to, demonstrate that any attempt at understanding someone else’s conversation, or the dynamic between two other people, is a strange and befuddling process. The second vantage point the work is concerned with is the complexity of interpersonal dynamics. The task of just having a conversation with another person is a particularly apt question for our epoch, so I found it remarkably appropriate the the production spent such a significant amount of time dealing with it. The first section of the piece features the fictional cam-boy Florida’s Finest chatting with Vasquez: despite their calls to each other, they talk past one another. Predictably, they find no genuine connection with one another, find no resolution, and eventually the internet feed between them is disconnected, an appropriate metaphor for the exchange. In a number of sections, performers literally say to one another “you don’t understand me” or “I can’t understand you.” Characters open their heart to others - they recount dreams or talk to new men at bars or reveal past lives - but are met with incomprehension and rejection. The work invests invests in the effort of trying to communicate, and the resulting complexity of the exchange. This leads directly to the third communicative vantage point the work considered: the individual, speaking out to no one - really to anyone - trying to be understood. In the sixth section of the work, an audio of Lurie rambling on about her anxieties drove home the slings and arrows of the loud call to be understood. She goes on about a surreal grad-school application, which is actually pretty hilarious, that would consume the spectators and performers alike after years of working on an oil rig. The endless dynamism of her mind is being expressed: we are granted access to inner thoughts and shown that she is an expansive, multifarious person. This is the heart of the work: the individual mind, any individual mind trying to be understood. The play, certainly concerned with and dealing with communication, discreetly and beautifully is all about how we all have endless, weaving minds, and a consequence of those complex internal lives is that they never may be understood. SOMEONEPLEASELISTENANDUNDERSTAND (they’re wiretapping our brains) is charming and dark and insular, expertly directed and performed with great care. Through Lurie’s dark and rhythmic sensibilities, the work is able to elevate our challenge of communication into a testament to all of our ineffable human intricacies.